Lake Michigan Beach & Views - jantar interior e exterior para 20. O refúgio de férias perfeito praia para famílias - Casa principal e adjacente Guest Cottage, vistas panorâmicas do Lago Michigan de ambos, piscina aquecida, a poucos passos da praia do Lago Michigan, espaço para 20 para comer confortavelmente, dormir ou reunir tanto dentro como fora. Vídeo e tours virtuais: clique no botão de passeio na terceira foto da minha galeria para ver o tour virtual ou clique no botão vermelho de reprodução do YouTube para ver um vídeo da propriedade. Uma caixa de jóias toda de vidro no topo da duna de areia com vista para o Lago Michigan. Um piso plano aberto inclui uma grande cozinha estilo galley, metros de espaço balcão aberto para buffets, uma grande área de jantar ao ar livre com capacidade para 20, área de jantar coberta que pode acomodar 20 em uma única mesa, sala de estar com vidro em três lados para lago e vista para as dunas, um quarto principal com cama queen size e um quarto de hóspedes com duas camas de casal e duas camas de solteiro em cima deles. Vistas de 360 graus trazem o Lago Michigan para todas as partes da casa, e a maioria dos quartos tem vista para o amplo deck da piscina, a área de jantar do gazebo e o Lago Michigan. A casa vem com 2 centrais a / c unidades, mas a brisa do Lago Michigan torna desnecessária a maioria dos dias e noites. Uma calçada circular pavimentada oferece estacionamento para até 4 carros. Conectado à casa principal por um caminho privado, o piso plano aberto inclui uma cozinha completa, sala de jantar com capacidade para 10, sala de estar com vidro nos dois lados para vistas do lago e das dunas, um quarto principal com cama king size e dois quartos de hóspedes com um total de 5 camas de casal. Abundantes portas de vidro deslizantes oferecem vista para o lago da sala de estar, sala de jantar e cozinha. Um grande deck percorre toda a extensão da casa no lado do lago, com muito espaço para refeições ao ar livre, tomando sol ou assistindo o pôr do sol. A casa vem com a / c central, mas a brisa do lago torna desnecessária a maioria dos dias e noites. Nossa garagem pavimentada oferece estacionamento para até 4 carros. A escada para a praia fica mesmo à sua porta. Desfrute tomando sol na praia, nadando nas águas cristalinas, ou andando quilômetros de costa serena longe das multidões da vida urbana. Se você preferir uma praia com salva-vidas, a Indiana State Park Beach fica a apenas 15 minutos a pé. Depois de um dia na praia, você desfrutará de um pôr-do-sol incrível sobre o distante horizonte de Chicago e, em muitas noites, você encontrará fogueiras oferecidas por simpáticos “Dunies”. O vizinho Dunes State Park oferece quilômetros e quilômetros de trilhas a pé, dunas de areia e ciclovias. Apenas 2 milhas para o novo Seven Peaks Water Park para as crianças. Os ciclistas também poderão aproveitar a ciclovia National Lakeshore, que fica a apenas um quilómetro da casa de campo e está livre de veículos motorizados. Valparaíso próximo ainda opera uma unidade no cinema para a diversão familiar à moda antiga. Desculpe, para proteger nossos hóspedes com alergias, não permitimos animais de estimação. Lake Michigan Family Compound é a praia perfeita férias para uma família alargada - vistas panorâmicas sobre o Lago Michigan, a poucos passos da praia, muito espaço para comer, dormir, ou reunindo dentro ou fora e apenas uma hora de Chicago. Imediatamente a leste de East Beach Dune Acres. We stayed at this property mid September and found it to have everything an extended family group could need. The main house is open, spacious and perfect for the entire family to gather. The cottage provided lots of extra sleeping accommodations and is steps from the main house. We took advantage of Chesterton and its cute shops and restaurants. We have a group of 4 families who shares this beautiful home and guest cottage over the Labor Day weekend. Our kids’ ages range from 8 to 16. They loved that they could go to the beach and come back to play in the pool. There was plenty of room for everyone. The houses were clean and nicely furnished. We hope to visit again! The house was well suited for our family and we had a wonderful and relaxing week. Michael was very easy to work with, responded promptly, and always available to answer questions. The house was well equipped with everything we needed. Check-in and check-out was simple, and the whole experience went smooth and easy. I highly recommend working with Michael. I hope we can come back again someday! Our family of 14 thoroughly enjoyed our week at Dune Acres. The main home is lovely with beautiful art, comfortable furniture and a well stocked kitchen. The guest cottage is charming and cozy. The views and sunsets are stunning and beautiful and add in the private beach and pool, perfect!!! The owners are responsive and helpful. We all agreed that we would gladly return to Dune Acres. Thank you Cheryl. So glad you enjoyed the house, cottage, views and the pool. We would be very pleased to host another vacation week for your family ! Oh my, what a beautiful setting! Our family of 17 (4 couples and 9 grandkids ranging from ages 5-16) enjoyed our stay for part of the 4th of July week. There were two homes with ample space and everyone remarked at their comfort. The homes were nicely located at the top of the dune. This allowed for a spectacular panoramic view of the lake, sunrise and sunset. The landscape was prolific and every morning we were greeted by lavender colored blooms! The main home and guest home are separated by a brief walkway/steps. The main home comes equipped with a roomy and stocked kitchen allowing for multiple folks to prepare meals simultaneously. The living area in the main home was also spacious enough so that our entire family could spend time together without feeling crowded. We had the choice of cooling off in the pool or the lake. Most days we took the steps down to the lake to spend a few hours enjoying the private beach. The steps were too steep for one of our family members but there was an alternate way by driving which took a couple of minutes longer. Every day we ended up spending our evening with kids frolicking in the pool as we enjoyed the display of color across the sky. I should mention that the outdoor temperature was in the 90’s during our stay. We were relieved that both houses had a reliable air conditioning system that never skipped a beat. Many thanks for the great family memories that were made during our stay. We hope to return soon. Relaxing with a gorgeous view! This is probably the best view we have ever had while vacationing. 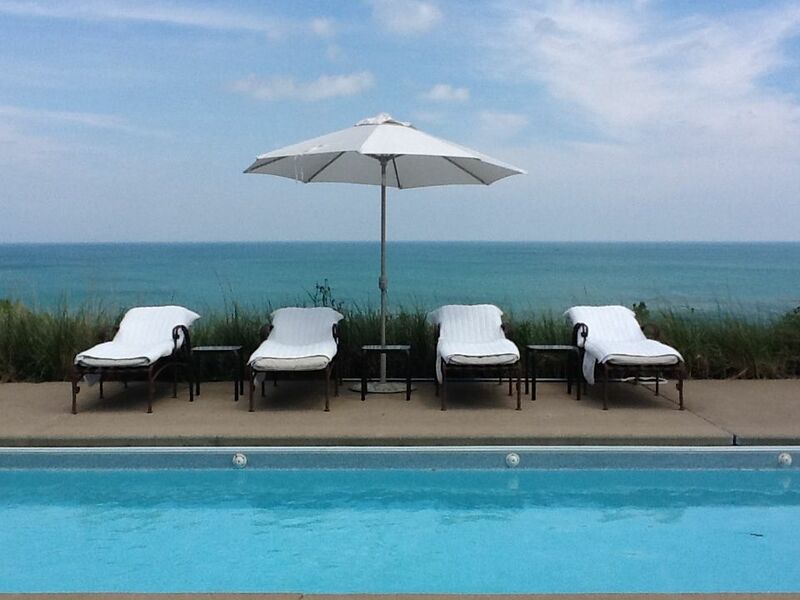 We spent most of our time in the heated pool with the beautiful Lake Michigan as our back drop. In the evening we watched the sun set on the lake - gorgeous! We cooked in every evening because there were 15 of us (6 of which where under 7). The kitchen was well equipped to handle our many big meals. Michael was very accommodating, checking to make sure everything was okay on the day we arrived. Great to hear you enjoyed your vacation. Seeing Lake Michigan and sunsets from inside our own private pool is one of our favorite treats too. Glad you used the kitchen too. We haven't been able to find restaurants that offer better outdoor dining experiences. Next time consider using our private chef so you can spend less time in the kitchen. Localizado a apenas 2 milhas da I-94 na saída Indiana Dunes, é fácil chegar de carro em menos de uma hora de carro de Chicago. Para aqueles que precisam voltar para Chicago ou chegar ao aeroporto durante as suas férias ou aqueles que querem experimentar a cidade, a linha de trem Chicago South Shore fica a apenas 5 minutos e vai do oeste até o centro de Chicago e East até o aeroporto South Bend. . Nossa área tem muitos recursos excelentes para férias em família. supermercados, cafeterias, sorvetes, pizzas, comida e várias opções de restaurantes familiares ficam a apenas 4,8 km de distância, em Chesterton. E para os cozinheiros, o mercado europeu da Chesterton oferece uma oportunidade para encontrar produtos locais, produtos frescos, queijos artesanais e charcutaria todos os sábados. Produtos locais, presentes e antiguidades também estão disponíveis na encantadora Schoolhouse Shop. Além disso, há uma grande variedade de opções de refeições gourmet e familiares na área. Veja www. IndianaDunes. com para muita informação para os visitantes. All rates subject to 7% Indiana Sales Tax. Refundable security deposit required. The rental week starts after 3:30pm on Fridays and runs until 10am the following Friday – that allows the housekeepers and us to prepare the house for the next family’s vacation. A $1000 deposit is required to confirm your reservation and the full rent is due 6 weeks prior to check-in. Upon check in the deposit becomes the security deposit which is refundable within 10 days of check out. Reservations are non-cancellable and non-refundable.